Georgia Tech, being located in Midtown Atlanta, has supposedly had gigabit internet on campus for some time now. I wanted to test the speed for myself. 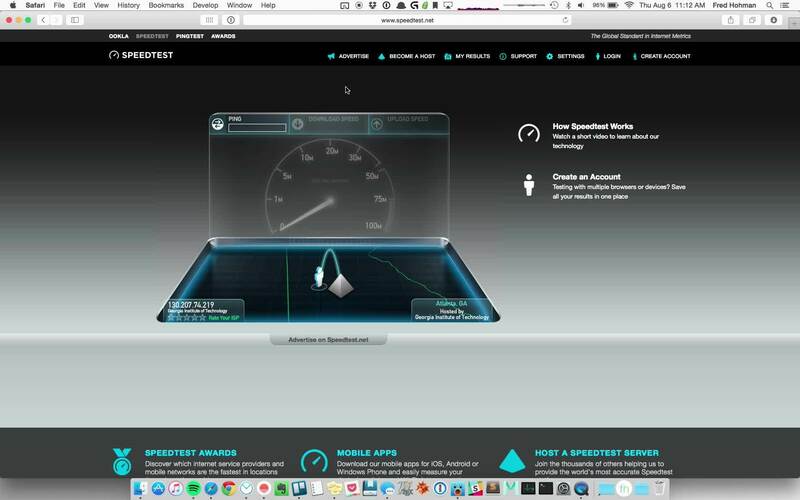 To do this, I simply loaded up speedtest.net, plugged in my laptop to an ethernet port in the Klaus Advanced Computing Building (Georgia Tech’s College of Computing), and clicked “Begin Test”. The results are in two .gif’s below: one for download speed and one for upload speed. 922.43 Mbps download and 932.64 Mbps upload. That’s awfully quick1. To put the download speed into perspective, it’s roughly 37x faster than what my parents pay for outside of Atlanta, and about 12x faster than what my roommate and I pay for in the city. Maybe one day soon I can get gigabit internet in my apartment since Atlanta has been targeted by Google to bring Google Fiber to parts of the city, with AT&T and Comcast soon to follow. RT @arball: those at #smskills10 that don't know - #GeorgiaTech has the second fastest internet in the world. Second only to the #Pentagon.